If you have $45 to spare you might want to pick up a book called The Way We Genuinely Live: Masterworks of Yup'ik Science and Survival. The book is of the coffee table genre and lavishly illustrated with color photos. The book reflects a fairly recent trend of including native commentary on native objects, in this case, Yup'ik artifacts in the collection of the Ethnologisches Museum Berlin. It is the commentary by several Yup'ik elders who traveled to the museum that makes the book especially worthwhile. It is their stories and reminiscense that makes the objects come alive. 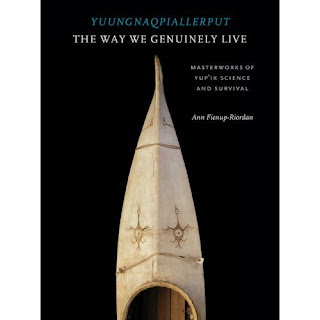 One of the things that struck me in reading this book is that no comparable book exists for the Aleut culture. I wonder of course why this might be and my theory is that the Yup'ik culture was not colonized and consequently changed much until recently. The Aleut region by comparison was discovered by Russians in 1741 and quickly colonized thereafter. Colonization for the Aleuts meant first of all a decline in population of some 90% within 50 years of Russian arrival. This meant that there was a much smaller population to carry on the culture. Secondly, the surviving members of the culture were pressed into service by the Russians and integrated or subjugated to their economy. This meant that traditional ways of making a living were severely impacted. I don't know much about the history of the Yup'ik region but I suspect the decline of their traditional culture came much later because they had nothing much that European Americans were interested in, and as a consequence were mostly left alone. It was the sea otter and the fur seal that interested the Russians and apparently the Yup'ik were lacking in these and so concentrated on the Aleutian region instead. In any case, it is fortunate that Ann Fienup Riordan has organized this book and recorded the fascinating history of Yup'ik artifacts. The book is a welcome departure from the usual catalogs of Arctic artifacts that do little more than name the objects illustrated and the place where they were collected and leave us to guess how they were used.